It was a transformational experience for many Americans watching planes crash into our World Trade Center buildings on September 11, 2001, killing thousands of our innocent citizens. Many of us knew in those horrific and dark hours that our nation would never be the same. In the days and years following 9/11, we would discover that we were also under attack by elements within our own nation that mailed weaponized anthrax to lawmakers and members of the media, those who misdirected our costly national response to attack Iraq and Afghanistan, and those who either recklessly or deliberately opened the legal and illegal immigration floodgates resulting in massive losses of American jobs, taxpayer resources, and lives! Many Americans like us were shocked and horrified when we discovered after the 9/11 attacks that our borders were left wide open and our own government under Bush, and then Obama, was pumping in millions of illegal immigrants combined with a historic level of legal immigrants to allow our enemies to walk freely among us! These disturbing assaults on our nation have led many concerned citizens to go looking for answers and details about the recent history of illegal immigration in American. While American citizens have been forced to endure very aggressive and invasive security at airports combined with an unprecedented loss of privacy and Constitutional freedoms during the "War on Terror," those same elites pursuing our subjugation have left America's borders woefully undefended. These treacherous elites cannot reconcile the War on Terror with the Open Borders they have created. America's national response was severely misdirected into Iraq and Afghanistan away from the true sources of the 9/11 attacks, which came from immigrants from Saudi Arabia, Lebanon, Egypt, the UAE, and from mysterious sources with access to weaponized anthrax within our own government. September 11 was an immigration vectored attack on American citizens! So while our young American men and women have been delivered to our enemies in the Middle East to die or have their bodies, minds, and futures permanently wrecked through very lengthy combat deployments we know will give them mental illnesses like PTSD, America's borders and defenses at home have been sabotaged from within our own government. Imagine the shock of our returning soldiers and veterans when they return home and find their communities inundated and invaded with the very people they went to fight abroad! Learn More About the History of Illegal Immigration by joining our e-mail alerts! And while many American workers have frantically called federal government offices, specifically the offices of the Department of Homeland Security and USCIS, to Report Illegals, our government refuses to take action and enforce our existing laws designed to protect our citizens most of the time. That is why ALIPAC was founded on 9/11 of 2004 and our Platform stands in support of America's existing border and immigration laws. America's biggest secret since 9/11 is that thousands of American citizens have been attacked, raped, robbed, and slaughtered by illegal aliens each year. In fact, the list of problems with illegal immigration is almost beyond measure. While our soldiers have been sent to the other side of the planet, America has been invaded at home by illegal immigrants backed by big banks, businesses, and billionaires! When additional losses for those who lost their jobs, homes, healthcare and communities due to job displacement are calculated, the toll becomes one of the worst calamities in American history. America's biggest betrayal is that those responsible for using our tax monies to protect our citizens from any harm by those who would come here from outside of America have either failed to do their jobs or have intentionally left us under attack by illegal immigrants and the terrorists among them. Closer inspection of the "illegal immigration as a weapon" phenomena finds a host of power groups, cartels, gangs businesses, politicians, political parties, and billionaires behind the betrayal and influx. Their interest in invading America with millions of illegal immigrants ranges from making money, importing drugs, harvesting wealth, and propping up consumer and real estate market bubbles, to fundamentally changing America into a permanent socialist nation by adding more than ten million Democratic Party voters. Here at Americans for Legal Immigration PAC aka ALIPAC you can find the complete history of illegal immigration since the end of 2004. 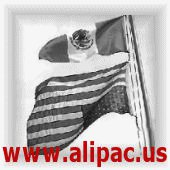 ALIPAC.us is the world's largest archive of information about illegal immigration, and it is here that you will find the modern history of illegal immigration into America, those responsible for the illegal alien invasion of our homeland, and the names of many of the illegal immigrant criminals and American victims! Our volunteer activists have painstakingly archived illegal immigration articles, news releases, blogs, illegal immigration facts, and important stories to create a resource for American citizens and lawmakers researching illegal immigration and illegal immigrants. Our organization's history fighting illegal immigration and Amnesty since 9/11/2004 can be found in our Announcements Section (CLICK TO VIEW). Many articles, blogs, and opinion pieces about illegal immigration can be found in our General Discussion Area (CLICK TO VIEW). And while we have a special section for illegal immigration articles written by William Gheen of ALIPAC (CLICK TO VIEW), our main article collection point is in the illegal immigration News Stories & Reports section (CLICK TO VIEW). We also have a large collection of illegal immigration videos (CLICK TO VIEW), and a YouTube channel with many very interesting Videos about Illegal Immigration (CLICK TO VIEW). While researching illegal immigration, you may also find our search feature useful (CLICK TO VIEW). The history of illegal immigration and illegal immigrants in America since September 11, 2004, is both vast and complex but here at ALIPAC.us you will find the world's most extensive and comprehensive resource on these issues. Thank you for taking an interest in the history of illegal immigration and our efforts here at ALIPAC. Please join our e-mail alerts and contact me if I can provide you with more information or assistance.